Come see this gorgeous ready to move in 4 bedroom 2 bathroom residential home, great location at the Sawgrass Bay community. This home offers 4 bedrooms, 2 baths, open & spacious family room fully furnished and professionally decorated. This home has granite counter tops stainless Steele appliances, upgraded European washer dryers. Perfect for any resident who is looking for a high standard clean ready to move in home close to Walt Disney World or for any INVESTOR who is looking for a home with great ROI opportunities. Home is not in short term rental community!. For more details and photos or to schedule your private showing, visit 3820 Ryegrass St. . If you have questions regarding this property or any property in the Orlando/Four Corners area, I’ll be more than happy to assist you. 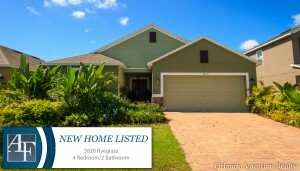 Call us at (407) 800-0888 or send me an email An@OrlandoVacationRealty.com.